CES is home to gadgets designed to help, but you may not be prepared for the level of help one gadget we saw could do, making your least loved laundry chore a thing of the past. The week at CES has only just begun, but we’ve already seen TVs, headphones, and computers, and in truth, these are they’re kind of expected. CES is always home to audio and video, and computers and cars. But a device you might not expect is one made to make mince meat of a chore few enjoy, if any at all: it makes folding our laundry as simple as sticking it back into a machine. Called the “Foldimate”, it has been seen at CES in years prior, however this year it is now a fully functioning prototype. We were able to feed the Foldimate multiple garments, from polo shirts to pillow cases, and almost like magic, they would appear in a neat pile all folded in just seconds. We asked, we checked and we even called out, and while you might think Foldimate is cheating, there was no small child inside the machine doing the work. Instead, the team at Foldimate has been working for years to make this project a success, each year seeing a little more progress than the last. 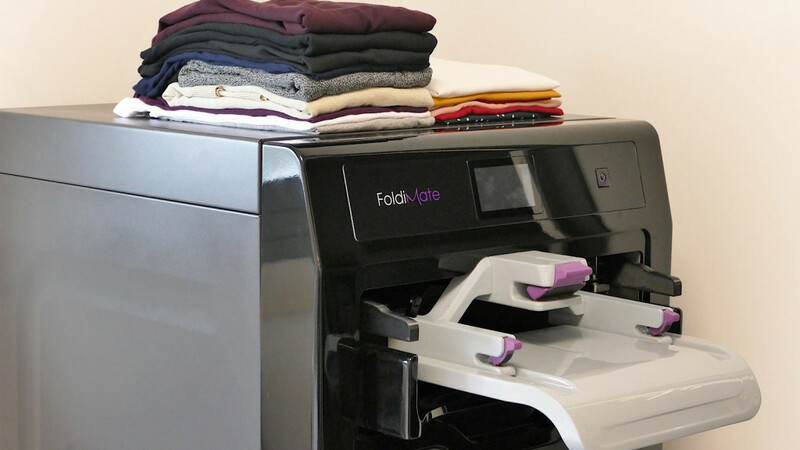 This year is the closest Foldimate has ever been, solving the boring task of folding laundry by simply feeding a machine the garments that need to be folded. As its development continues, we’ll be looking forward to seeing the Foldimate add the ability to fold pants, bed sheets and baby clothing, something that is currently restricted due to the size requirements of the machine. At the present time, Foldimate will handle tops ranging from children’s tops to those massive XXL tops, handling shirts, happily folding t-shirts, polos and even the button up shirts you might struggle with. While completely impressive, Foldimate is still a very large product, and close to the size of a washing machine. That makes it a little unlikely for most people, though given that is has no real price tag or availability date, that’s probably no real problem, at least right now. It is coming, though, with the US likely to get it first, priced initially around $1,000 and coming the Americans around the end of 2019. Tech commentator for Channel Seven and Your Money, Geoff Quattromani offers leading technology insight across Australia through web, TV, and radio.